At Casa de Koehler, you and your friends and family will feel like you are at your own little hotel or spa. The house was designed with outdoor activities and entertaining in mind. We are located about three miles from Cabo and about one-fourth mile up from the water's edge in a development called Villa Serena. The 3900-square-foot house(with additional 2000-square-feet of balcony) is split level , so there is privacy between sections. The property is actually 2 lots , one has the Casa, The other is the pool, palapa, v ball etc.,which equals out to plenty of space for your outdoor living, recreation, and entertaining. The tropical-style pool has a jacuzzi that spills a sheet of water into one end. There is a soaking cove and swim-up bar with six submerged stools and a huge overhanging palapa roof to keep you cool while sipping your Margaritas. The palapa has a full bar, built in couch, dart board, table and chairs. Near to the pool is a 48' built-in gas barbecue shaded by a rustic-style bamboo roof. Enjoy your dinners in this charming outdoor atmosphere. There is also a large sand area with a gas firepit in the center. The upper portion of the property has a full-size sand volleyball court that has two large palm trees that hold up the net. The property has fruit trees, palm trees, and cactus to give it a tropical, desert feel. 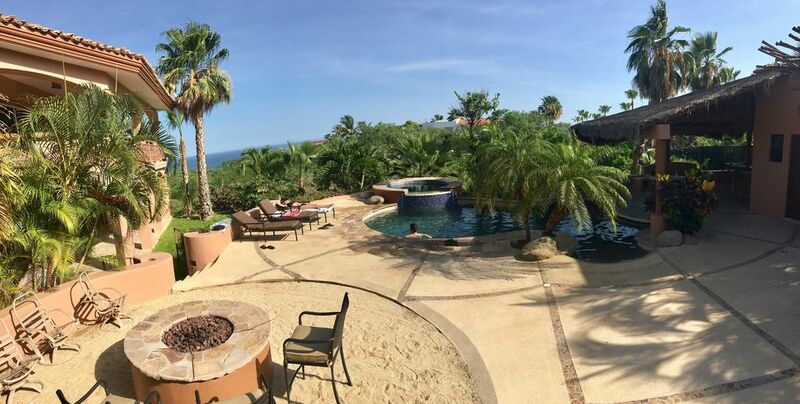 Please Note: Although Casa De Koehler provides a private setting for the perfect Cabo San Lucas getaway, we are located in a peaceful residential community. We politely request that guests and visitors remain respectful to our neighbors during their stay, and refrain from excessive after hour noise and overtly public adult activity on the property and within the neighborhood of Villa Serena.Minimum age for the responsible person present is 30 years old. Cooks,bartenders, catering, readily available.On site spa treatments can be arranged as well. Call ahead and we can prestock your kitchen with food and beverages. Let us do the work, you are on VACATION! Mike, Deborah, and Clayton Koehler. One of the main reasons to rent Casa De Koehler is to have your own private, beautiful property, that is filled with things to do. Friends and Family can have so much fun together , never feeling cramped on our 1/2 acre property. The unique benefits to our Casa is that the living arrangements are separated into 3 sections. Not everyone has to be on the same schedule. Also unique to us is that we have 2 lots, one has the Casa and front area, but the other lot has nothing but outdoor living in mind! A Sand Volleyball court, Pool, BBQ, Palapa, Bar, and full mature Fruit and Palm Trees through out the property give it the true Mexican Feel!! This house was perfect for our family! All the amenities you need to keep kids and adults entertained. We will definitely be back! Property was exactly as described. The views were amazing the pool was on point. It accomadated nine guys with absolutely no problems. Jorge was there for us to answer any questions and was an excellent manager. Scheduling transportation was a breeze and they were always on time. I can not reccommend this property enough, you will not be dissappointed. Nicholas, Jorge told me you guys were a great group and we are glad you had a good time. We are happy to have had you stay with us. Great stay. House was well equipped. Staff very helpful. Great for a large group or family. A wonderful vacation rental for 2 families! Great amenities and spectacular views. My family and my brother’s family spent New Years week here. It was very nice. The service was excellent. Jorge stocked our fridge before our arrival. The maids routinely came and tidied up the place. The yard with the pool, hot tub and fire pit were a delight. The views from the deck were great and from the roof deck spectacular! We saw 5 different firework displays from the roof deck. It’s nice to hear from a guest after a visit to our Casa and it sounds like the trip was a success. Jorge is the best and I’m glad to have him. I hope you got some surf Fred and please come and stay again. Call me for a returning guest special. This Property is Even Better in Person! I absolutely LOVED this property! It completely exceeded our expectations. Not only is it huge and gives everyone a ton of space, but it has multiple kitchens, amazing views, and it's walking distance to a private beach. It's also in a gated community that you feel safe in. Plus it's in walking distance to a small market with healthy food options which we walked to almost daily and a couple restaurants nearby. I would highly recommend this place to anyone who wants to stay in Cabo, it was wonderful! I will definitely recommend and come back to this place. Jorge, the house manager was awesome. Showed us around and helped get any extra things we missed during our costco trip. The place is quiet and had everything we needed to have a great time in Cabo. The maid service was nice as we had a large group of guys that don't always pick up after themselves. House is in a great location between a lot of golf courses and downtown. Thanks again and can't wait to return! If a credit card is used for payments, an additional 2.9% fee will be added to cover booking fees.